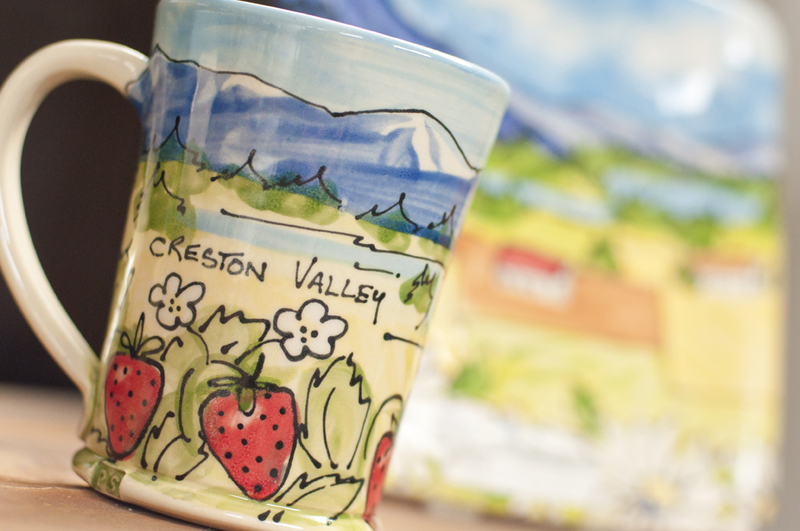 More than 20 years after Nancy Pridham started making pottery, her iconic designs are still instantly recognizable, with bright glazes depicting, for the most part, scenes in and around the Kootenays. Although she retired in 2011, her daughter and son-in-law are carrying on the tradition in their 12th Avenue North studio. “My parents were trying to sell it for over a year and we thought, ‘Why don’t we do that?’ ” says Micah Wassink. At the time, they were living in Victoria, where Micah worked in the film and theatre industries, having earned a bachelor of fine arts degree at the University of Victoria, and Jeremiah worked in metal fabrication, having become a welder through Camosun College. They moved to Vancouver Island on the August long weekend in 2001, returning to Creston on the same weekend in 2011 to buy the home Micah was raised in since Grade 2, after her parents sold their strawberry farm on the flats. “Our friend came out with a big dump trailer,” says Micah. “We loaded up everything and moved back to the Kootenays,” says Jeremiah. That was the beginning of the learning curve. Micah’s parents, Nancy and David, had been splitting their time between Creston and Mexico, so there was an intense training period for Micah and Jeremiah before her parents left town for the winter. David had eventually become involved in the business — Nancy needed help keeping up with the demand for mugs — so he passed his knowledge on to Jeremiah. That meant cutting and weighing clay, and making mug handles, an art in itself. From there, he advanced to throwing (the term derived from an Old English word meaning twist or turn) his own mugs, and now makes about 1,500 a year. 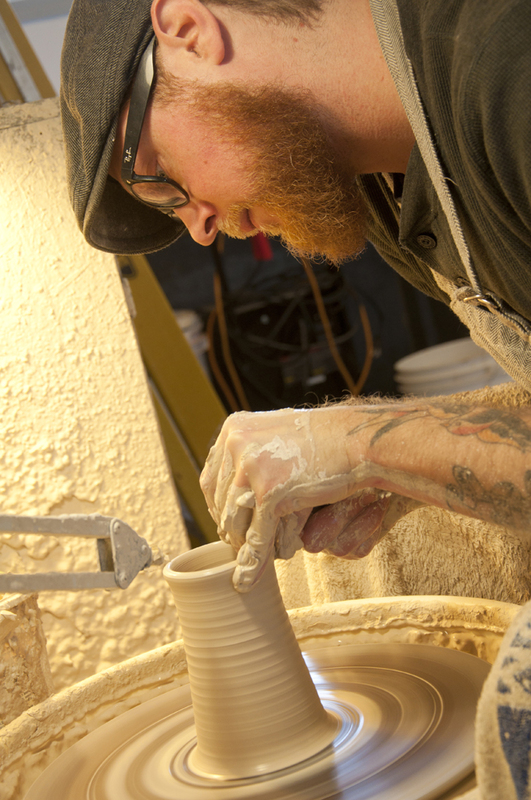 He now throws pieces including bowls, vases and teapots, and builds slab pieces, such as side plates and serving bowls. And with the help of a friend who works with sheet metal, he’s created an angular mould for a large serving bowl, a design he’ll experiment with in the near future. Working with clay wasn’t new to Micah. In the early years of Nancy’s foray into pottery — she actually started Pridham Studio nine years before making pottery — she and her sister would roll out the clay by hand and press it into woks to create bowls. 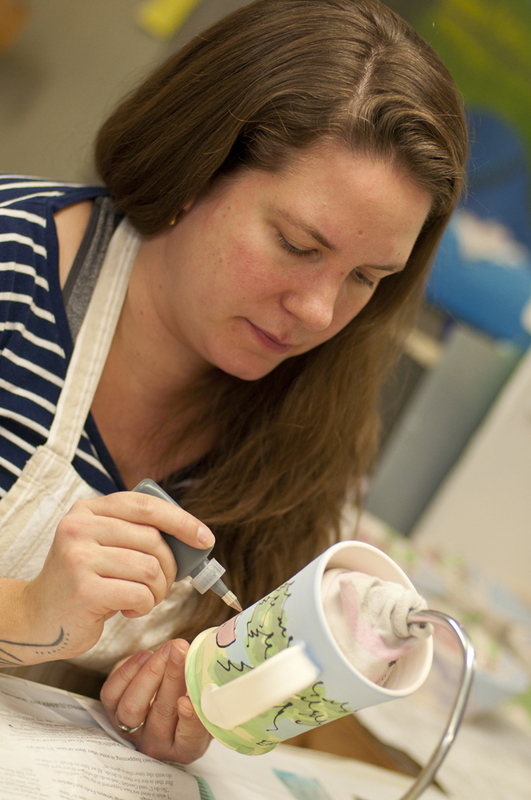 Upon her return to Creston, Micah accepted the challenge of painting the pottery, continuing to use the distinctive Pridham Studio designs her mom had created. “With the way I paint, I’m skilled at copying imagery,” says Micah, who now regularly paints over 20 patterns on 13 forms, drawing on the inspiration of her B.C. upbringing to create new themes and scenes. All of their products are functional — designed to be used, not just displayed — and can be found in many Kootenay shops, and as far away as Whistler. The combination of wholesaling and selling in their shop has helped the studio to maintain a presence in Creston. As Micah and Jeremiah have developed their skill in the studio, they’ve been able to offer a wider range of products, as well as custom orders. Some of the more recent orders have included a plate memorializing a beloved dog, and a woman from Alberta had a photo of her family farm reproduced on mugs. Both projects were met with enthusiasm. “It’s pretty cool when you can create something for people and they break out in tears,” says Jeremiah. And more creative projects are percolating, with an expansion of shop space allowing Jeremiah to bring metalwork into the creative mix. “Stuff changes and evolves,” says Micah. •Learn more about Pridham Studio at www.pridhamstudio.ca, or follow it on Facebook or Instagram.